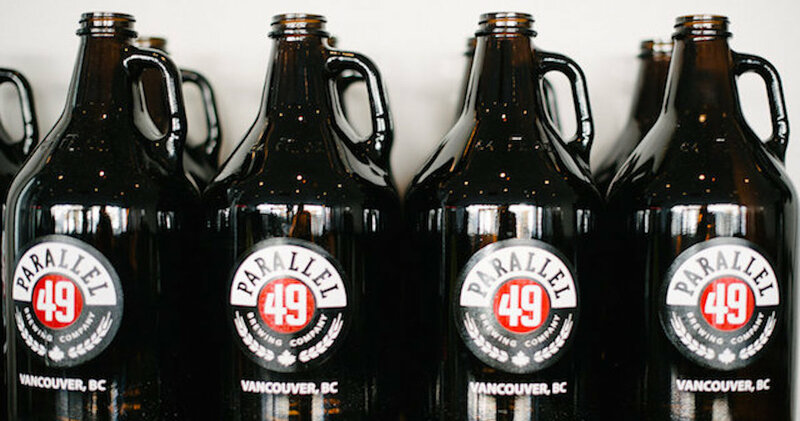 Parallel 49 Brewing Company was one of my most anticipated Breweries of the West Coast! I have to say for a brewery which has been around for one two and a half years, they are amazing! This brewery has come out with so many different beers. Not just beers, but GOOD beers! Walking in to the brewery it looks very updated on the front end. With the new liquor laws that hit BC they are able to have a tap house be in full working order. They even have an infusion bar where they infused three different things to make a special beer that you can find only at the brewery! Near the tasting bar, there is a a small area for their merchandise which is being taken over by all the awards they have won so far! Not to mention a few refrigerators with all sorts of beers in it. I was greeted by Chris who was a gracious host for giving me a tour. I got one of the best tours… well they all were good but this one Chris actually took me and said “I’m sure you have seen how the vats and the mash ton’s work so let me show you what else we have” and he showed me something other than how the beer was made! Let me say it was epic! He did research on me I’m sure, because he showed me where the new vats were (they are finally getting the last of them installed as this review is coming out) as well as a few other places that he doesn’t normally show people, like the warehouse where all the beers they have made are ready to go out to places in Canada AND the US. Twenty of the US states get the goodness of Parallel 49 beers! He didn’t give me the typical tour… I got to see how the bottles go into the boxes which is very cool and I have not seen any other brewery have this set up. As well as where the barrel aged beers are hidden for some of their special beers, the lab where they come up with some of the great concepts, staff rooms and the owners area where some of the great ideas for the beers come from. Pretty much all of the brewery which is spread across two warehouses didn’t look that big from the outside but it is quite massive over all. There was so much that I got to see that was truly worth seeing and their tour was different from all the rest as they promised it would be, just like their beers which are quite original as well. The beers I got to try while I was in the tasting room were all amazing, they were the Tricycle, the Filthy Dirty, and the N2 Milk Stout (Nitro Series). Even seeing it being poured and watching it settle in the glass was an experience to see! Overall this tour was amazing, the beers are awesome, the people that work there are great and really passionate about their beers that they make there. If you ever are in East Van and you want to sit down and have some great beers, or even go for a tour of their brewery contact them!